Spanish Vocabulary for kids with this fun game, Go Squish! Who doesn’t love learning through play? Foreign Languages for Kids by Kids® created a fun, engaging Spanish game your kids will want to play over and over. It is only $20 and a great (and inexpensive) way to get started with a second language in your home! Make sure to pin this image for later! Bring Fun into Your Homeschool and Teach Spanish Vocabulary at the Same Time! 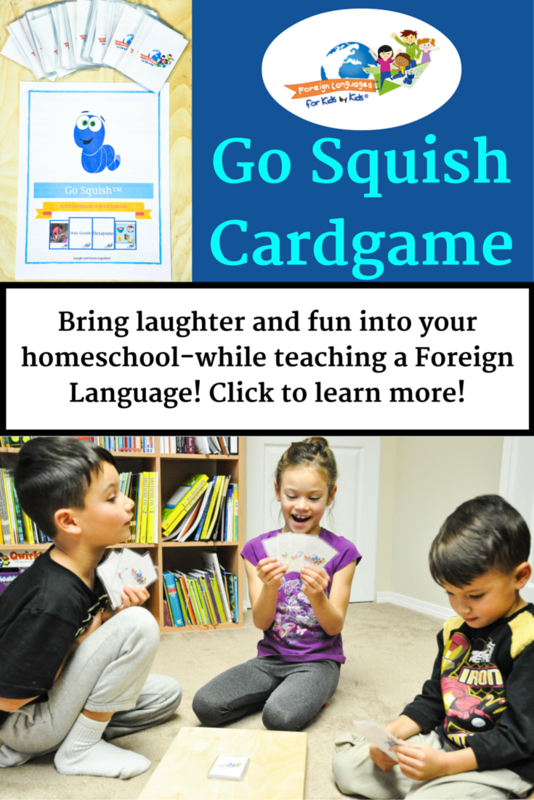 Go Squish is a card game designed to coincide with the videos in the Foreign Languages for Kids Spanish curriculum. It comes with three sets of cards, one for each video in the first DVD volume. The card game can be purchased on its own or used as a supplemental activity. 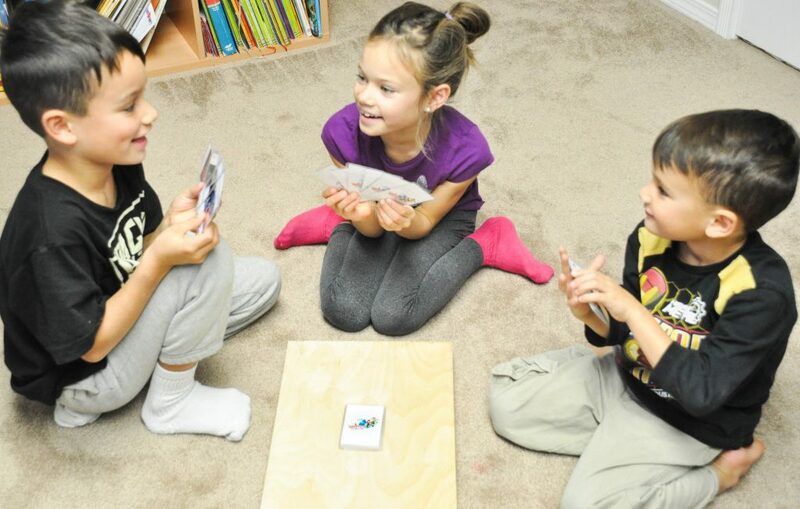 It is designed to be played in groups of 2-4 players, though you can play with more children if you combine the cards. There are two levels of play to give your children a gentle and fun introduction to Spanish vocabulary with room to grow. The object of the game is to get enough miles to fly Squisher, the International Inchworm™ to visit his friend. You can choose how many points are needed at the beginning depending on the number of children playing and their experience with the game (more points will mean a longer game). You begin by dealing 6 cards to each player and placing the rest of the deck in the middle. In level 2, your children will learn how to ask “do you have?” and answer with “I have or I do not have.” Foreign Languages for Kids by Kids® created resources, materials, and a complete curriculum that is focused on teaching children conversational Spanish rather than disjointed Spanish vocabulary. The key to helping our children not only understand but remember the Spanish vocabulary taught, is to offer it in a way that means something to them! The words and phrases that are taught are ones that children can relate to and use in their everyday life. They will quickly be able to integrate their new Spanish vocabulary into their days and build confidence in their skills! This is a fantastic game, a ton of fun, and highly recommended as a learning extension for the lessons in the Foreign Languages for Kids curriculum or as a stand-alone resource. It is easy enough for children ages 5+ to play together and can be enjoyed by the whole family! It also comes with a full color, 5-page instructional booklet to help you learn the rules, give you examples, explain how to set it up, etc. You can purchase the game and complete flashcard set on the online store by clicking here. If you are interested in learning more about the online memberships, make sure to check out some of my other review posts here.